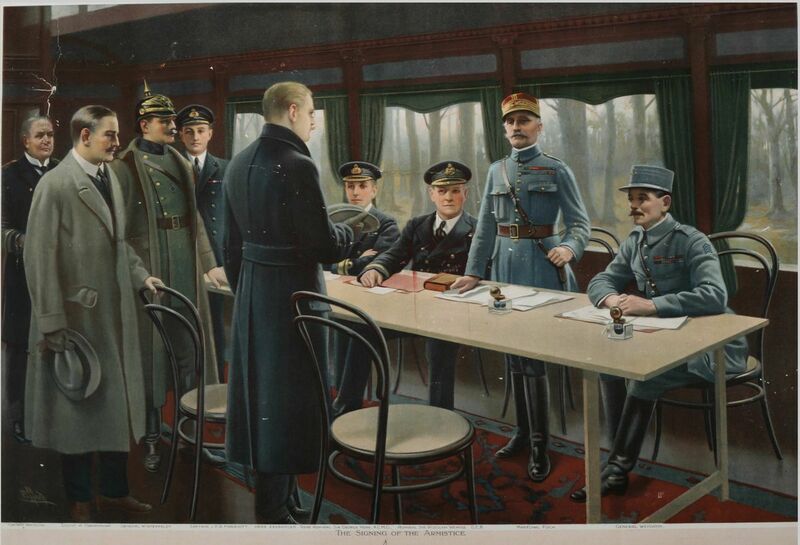 One hundred years ago, today, the “war to end all wars” came to an end with the signing of the final Armistice in a railroad car in Compiègne, France. The Austro-Hungarian Empire, Bulgaria and the Ottoman Empire had signed the previous three. This was not the actual surrender as the Treaty of Versailles formally ended the entire war. Signed on June 28, 1919, the treaty was on the exact day, five years later, of the assassination of the Archduke Franz Ferdinand of Austria. The last shot fired, closing WWI, was by the American soldiers of Battery E, 11th Field Artillery and a Schneider Howitzer named Calamity Jane. Edward George Honey, an Australian journalist, was the gentleman whom first proposed a moment of silence. The two-minute silence, practiced today, originated in Cape Town, South Africa, via that town’s then Mayor, Sir Harry Hands. Remembrance Day or, Poppy Day, is the memorial day observed in the Commonwealth of Nations and many non-Commonwealth countries and, evolved from the Armistice Day. Remembrance Sunday is observed by the UK and Commonwealth nations on the Sunday closest to November 11. Armistice Day is the primary holiday in France, Belgium and Serbia. Serbian people wear Natalie’s Ramonda instead of the poppy. The French wear the Bleuet de France, a Cornflower. ♢ Poland celebrates their National Independence Day on November 11. ♢ Italy celebrates their Armistice of Villa Giusti on November 4. ♢ The Republic of Ireland recognizes Armistice & Remembrance Day but, their National Day of Commemoration on the Sunday nearest July 11 is a reflection of their Irish War of Independence that started two months after the Armistice was signed. ♢ Denmark, The Netherlands, Norway and Spain were neutral and, have no specific WWI observances. ♢ Germany has a Peoples Day of Mourning covering all armed conflicts, observed on the Sunday closest to November 16. We, here in the U.S., at the behest of several veterans organizations, changed Armistice Day to Veterans Day in 1954 to honor all veterans, regardless of a specific war. It is a national holiday and different from Memorial Day (last Monday in May), which honors those whom died while serving and, Armed Forces Day (also in May but, the third Saturday), honoring those currently serving. This entry was posted in History, Military, National Days and tagged 11th day, 11th field artillery regiment, 11th hour, 11th month, 1918, archduke franz ferdinand, armistice day, bleuet de france, calamity jane, compiegne, cornflower, edward george honey, france, in flanders fields, john mccrae, moina michael, natalies ramonda, national day of commemoration, national independence day poland, november 11, peoples day of mourning, poppies, poppy day, remembrance day, schneider howitzer, sir harry hands, treaty of versailles, villa giusti, we shall keep the faith.